I have designed Nakamura Fukusuke Official Web site for the kabuki Actor Fukusuke Nakamura who is going to be entitled as Utaemon(one of the finest title of Kabuki) next Spring. The web site was design to be classic and gorgeous which fit with Japanese Traditional culture of kabuki and beautiful act of Fukusuke. The main color is white and Japanese Gold leaf paper and I use red, which is the main color used in Fukusuke’s life work play: “Dojo-ji” , as an accent color. Basic layout was designed to be similar to the web site for Kotaro who is son of Fukusuke, but the feeling of the site fit with characters of each person. Young and Fresh feeling for Kotaro’s web site with blue color of sky and flying birds. 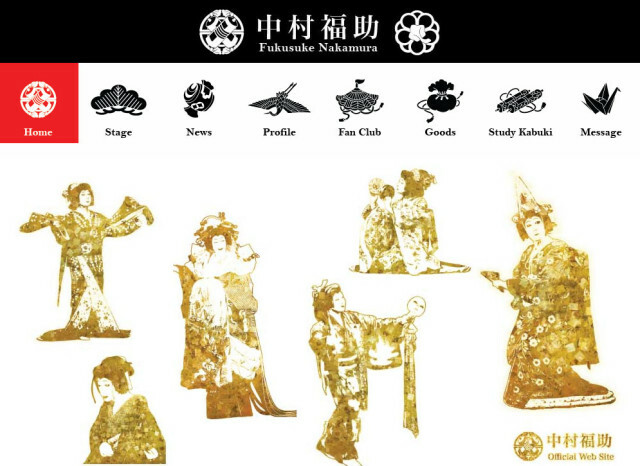 Gorgeous, Sensitive and Traditional feeling for Fukusuke’s web site. I am preparing Fukusuke’s web site in English now and please wait for a few days to enjoy the contents in English soon.